Today, I've got some mini reviews/first impressions of some new products I've been trying out. First up is the Origins Original Skin mask. This contains Rose Clay (a type of mild kaolin clay) so it helps to absorb excess oil/impurities on the skin. However, as this is a more mild type of clay, it is gentler and less drying on the skin so is great for more sensitive skin types. Using this frequently helps to reduce the appearance of pores and puffiness too. It also contains Willowherb, which is anti-inflammatory so great for rosacea and eczema. Finally, its third key ingredient is Jojoba beads, which provide a gentle exfoliation and are often used to treat acne. These are also biodegradable so no horrible plastic beads here! I actually was pleasantly surprised by this mask. Whilst I don't love the exfoliating beads (I find they're a bit hard to wash off and I always find I haven't got them all off by the time I do moisturiser! ), the clay aspect of the mask is amazing and my skin really did feel firmer and clearer the next day. I will definitely be incorporating this into my routine every couple of weeks or so! You can get this for £24 on Look Fantastic (this is just a sample size in the photo!). Secondly, I grabbed one of the new-ish Garnier Moisture Bomb sheet masks. 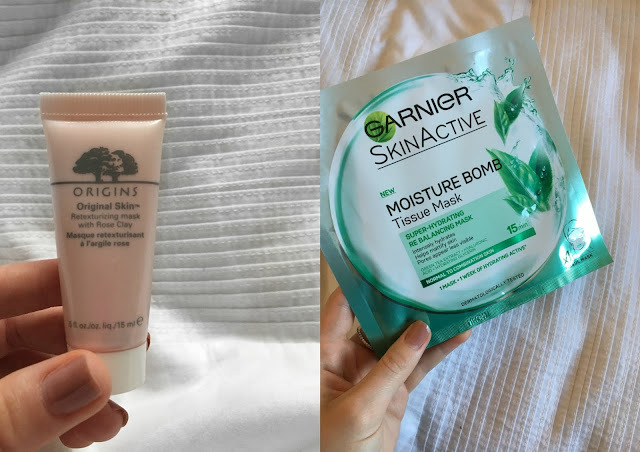 I've been intrigued to try these out as I'm loving sheet masks at the moment - mostly because they are fun to apply and I love the serum you can massage into the skin afterwards! These contain Green Tea Extract which is anti-inflammatory, and also helps to promote the health and quality of collagen, therefore giving you firmer and more elastic skin. Secondly, it contains hyaluronic acid, which helps the skin to retain moisture (great for dry skin, obviously! ), along with Glycerin which is an amazing moisturiser. I loved using this mask - it's only £2.99 so a bargain, although it does suggest using one 3 times a week which would definitely add up £££! The hole for the mouth is a bit small in my opinion, but it wasn't uncomfortable and you only have it on for 15 minutes. Afterwards, my skin felt and looked so glowy, and I massaged in the excess serum, topped with my usual moisturiser and my skin felt great. I love glowy skin too, and this definitely helped with that. I have normal-oily skin so can't say how good at moisturising it was, but the ingredients speak for themselves on that one! They do have a more moisturising one for dehydrated skin called the Revitalising Mask, which may be better for super dry skin. You can buy both these masks from Boots for £2.99. Have you tried either of these skincare products? And what are you loving in your skincare routine at the moment? Let me know in the comments!